Artist impression of the future Attack-class submarines of the Royal Australian Navy. Naval Group image. After over two years of negotiations, officials have finally signed an agreement for the construction of the Royal Australian Navy (RAN)’s future fleet of submarines known as the “Attack-class”. Another contract regarding the detailed design of the Attack-class submarine is set to be signed in the coming days. The design phase will last four years. “Naval Group is known for building world-leading, technologically advanced submarines and has built 100 of them for nine different countries. 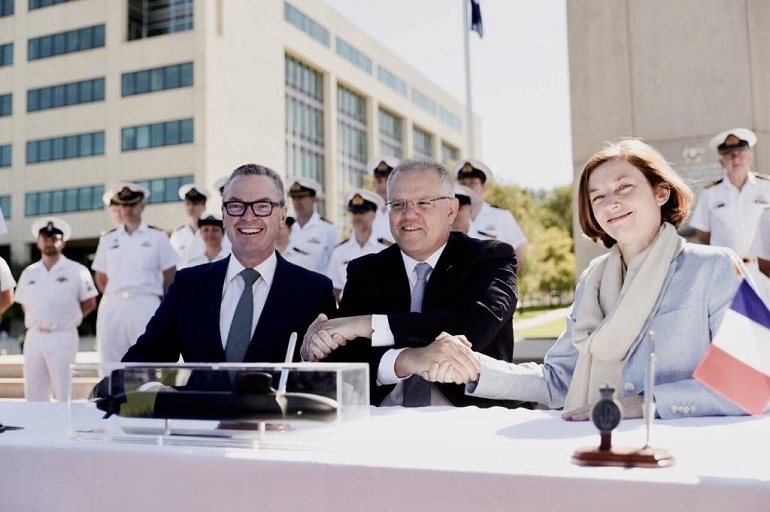 This agreement with Australia will see Naval Group transfer the “know-how” and “know-why” to Australia to become an sovereign submarine nation. We are very excited about the opportunities that lay ahead of us and are committed to delivering the Future Submarine Program for Australia. We are grateful to the teams from the Commonwealth of Australia and Naval Group who have worked hard to achieve this agreement. Herve Guillou, Chairman and CEO, Naval Group. The Attack Class submarines will give the Royal Australian Navy the capability and regional superiority that an island nation like Australia relies upon. This important project will create 2800 Australian jobs, built in Australia, utilizing Australian steel. Christopher Pyne, Australia’s Minister for Defence. Artist impression of the future Attack-class submarine of the Royal Australian Navy. Naval Group image. 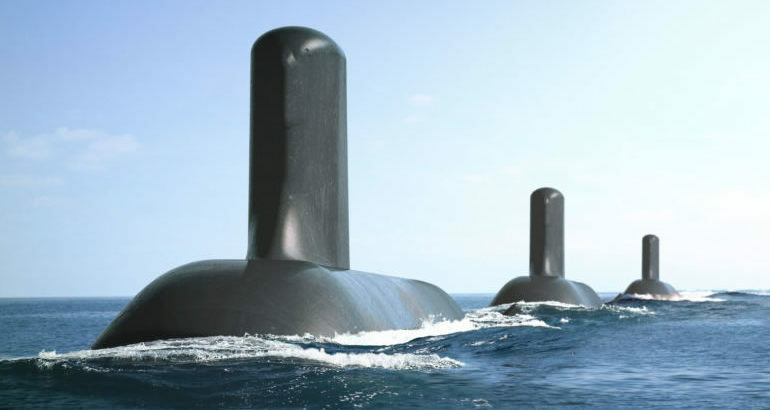 The Australian Government selected Naval Group (then known as DCNS) as its preferred international partner for the design of 12 Future submarines for the Royal Australian Navy on April 26 2016. In the SEA1000 project, DCNS was competing with the Shortfin Barracuda design against Germany’s ThyssenKrupp Marine Systems (TKMS) Type 216 and Japan’s Soryu-class designs. Based on the new Barracuda nuclear-powered attack submarine (SSN) of the French Navy (the first ship of the class is set to be launched this summer), Australia’s Attack-class submarine will be 97 meters in length and 8.8 meters in diameter. 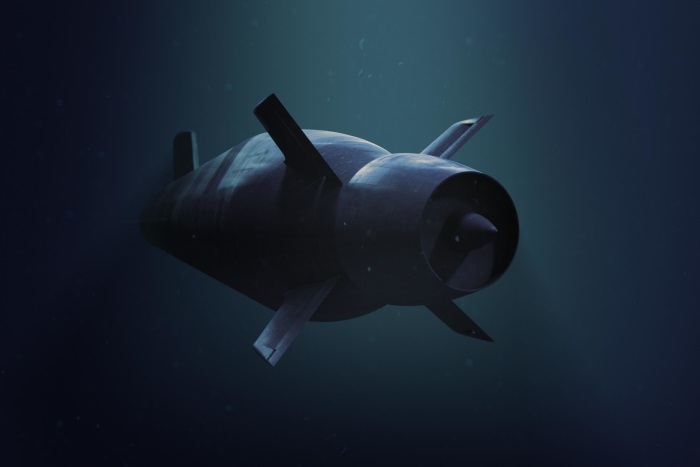 In September 2016, Lockheed Martin was selected as the preferred combat system integrator and signed the contract for the Future Submarine Combat System Design, Build and Integration in January 2018. Naval Group partnered with services provider KBR to support the design of a new construction yard at the Osborne Naval shipyard (South Australia) where 12 Attack-class submarines are expected to be built (with technology transfer from Naval Group). The submarines are considered the backbone of the Australian government’s US$63.8 billion (A$90 billion) National Shipbuilding Plan. Unveiled in May 2017, the unprecedented plan calls for 54 new naval vessels to be built locally.